Every child feels neglected at one time or another, but Coraline, the quirky and determined protagonist of the animated feature film of the same title, is positively starved for attention. Her parents are obsessed with a pastime that’s a product of the new millennium: they are too busy blogging to have time for their daughter. Children universally have fantasies of how their worlds could be more perfect, even if their childhoods are happy. 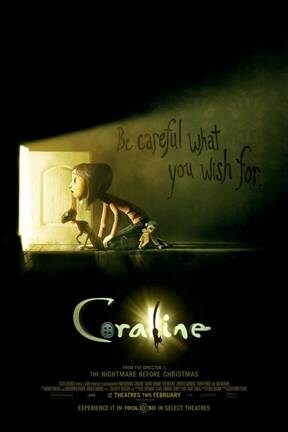 In Coraline’s case, her fantasy of that perfect world is realized in an alternate world where everything is just the way she would want it. Coraline has moved with her parents to a pink Victorian mansion in the middle of nowhere. It’s the kind of old musty place that has countless hidden secrets, and Coraline in her loneliness sets out to discover them. Her explorations are richly rewarded when she discovers a secret little door in the wall, and what child doesn’t love the idea of hidden passageways? At night, when everyone’s asleep, Coraline can’t resist crawling through the passageway. It is here that she discovers that more perfect world, comprised of her Other Mother and her Other Father. For the first time in her life, Coraline is the center of their universe. She eats delicious meals (her busy blogging mother sadly refuses even to make time for a trip to the grocery store) and has the time of her life. There’s only one thing that is just a little…off. This ideal Other Mother and Father have black buttons sewn on in the place of eyes, just like dolls. This odd fact unsettles Coraline a bit, but she is so caught up in the marvelous miracles this alternate reality offers her, that she decides to ignore it. Until she can’t, anymore. I’ve been excited to discover several children’s horror films that offer an alternative to “Harry Potter,” and this is by far the best one I’ve found. It’s dark, sinister, and just a little edgy. I’m going to recommend this one for ‘tweens nine and up, and I especially think girls will dig this one. Who isn’t a little creeped out by dolls with button eyes? Maybe it’s the lack of pupils that give them a zombie-like stare. Regardless, kids will find this story to be fascinating, especially when things start coming undone in Coraline’s “perfect” world. There is some edgy language like “rat crap” and “wuss puss,” but nothing stronger than this, and things get downright terrifying in a few parts, especially near the climax, involving children who met their maker and also have buttons for eyes. Parents might choose to screen the film if they are concerned that their kids might be sensitive to these intense scenes. Grownups will value the exquisite artistry of the stop-motion animation and the clever writing. The score is beautiful and again a little creepy, wonderful to get in the mood for Halloween. Don’t miss this one! It’s available on DVD. It’s definitely a fascinating animated movie, Malia, and really good enough for grownups to enjoy it as much as kids. It is quite eccentric in parts, but that only adds to the creativity. Great review. I’m sure a lot of kids would love this book. Thanks so much, Liz! The movie is an adaptation of the book by Neil Gaiman. The film is a faithful adaptation. The book has been deemed too scary for kids by some grownups, but kids love it. My daughter always talks about this movie..but I never really paid attention there are so many animated movies now…but you actually have made me wanna view it! Thank You for your review! Awesome, Jessica! Thanks so much. I think this movie will be very memorable for your daughter, and it’s a great movie to watch to get into the spirit of Halloween. Definitely awesome animation, Natasha! It’s worth watching for that alone. The animation blows my mind, considering that it’s stop motion and that in each and every frame the characters are carefully posed. I loved this movie and it does have outstanding graphics.